Veronica and I scramble among volcanic tuff boulders and twisted juniper trees at Shaman Knob in the Mt. Irish Archeological District of Basin and Range National Monument. A large round figure dominates a curved rock panel that rises to just above eye level, a pale form pecked into a dark field with skinny arms and three claws on each appendage. Pahranagat man. This style of rock art is unique to the Pahranagat Valley. It depicts human figures with oval or rectangular solid-pecked bodies, skinny legs, and arms ending in long fingers. Often they have big blanks for eyes. Another variation on the Pahranagat man is an anthropomorph composed of straight lines and geometric shapes. I imagined how it happened. Someone picked up a tool, swinging one precise stroke at a time, painstakingly hammering out these drawings, forming figures from the mind’s eye. Why? Did they expect future societies to know what they meant with their illustrations? 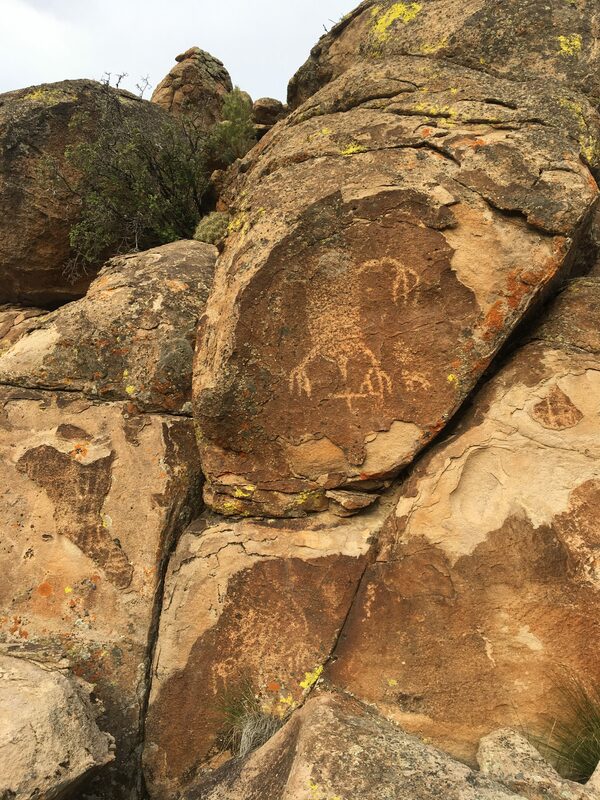 Archeologists speculate that petroglyphs could have been carved by shamans for healing or hunting magic. A more recent interpretation is that rock carvings were a way of mobile societies to establish enduring landmarks and make their surroundings culturally meaningful.